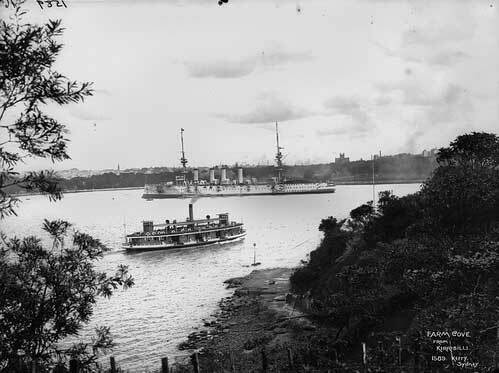 Sydney's Powerhouse Museum has put up an interesting old photo showing a 4-stack warship. I wonder if you or your friends can help to identify the ship. If so, I'll tell the museum so they can add that to the information about the pic. It was taken some time between 1900 and 1917. A good deal of detail can be seen using the zoom facility, including the white ensign flying at the ship's stern. 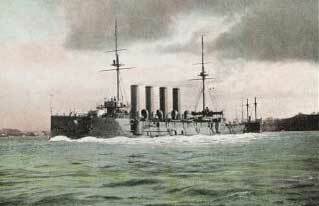 Cressy, Aboukir and Hogue were all sunk by German Submarine U-9 in a 75 minute time slot on September 22nd. 1914. 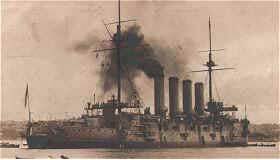 Of these cruisers I believe that HMS Euryalus was the only one to serve on the Australian Station, and she would be my choice. I landed on your page asking about the identity of a 4-stack warship: "HMS Euryalus of the 4 funnel Cressy Class cruisers in the RN"
The ship is one of the two Powerful class cruisers: HMS Powerful or HMS Terrible. 1. The two centre funnels were closer together; the other classes had evenly spaced funnels. 2. A flush deck extended all the way to the stern; the other classes had a noticeable break in the deck at the stern. Please add to our URL: "HMS Euryalus of the 4 funnel Cressy Class cruisers in the RN"